Alexander Hamilton, one of our nation’s prominent Founding Fathers who served as the first Secretary of the Treasury under President George Washington, was a hero to many political leaders. This was especially true for those who served during the 1920s. As a close adviser to President Washington, Hamilton was the “chief architect” of the administration’s policies. It is said that Hamilton is the “Father of American Capitalism,” and, as historian Forrest McDonald wrote, his fiscal policies “breathed life into the Constitution.” President Calvin Coolidge, who was influenced deeply by the American Founding, was influenced by Hamilton’s political and economic thought. Hamilton’s influence on policy leaders during the 1920s and even into the 1930s can be seen clearly through the many speeches and references made to him by individuals such as Presidents Warren G. Harding, Coolidge, and Herbert Hoover, Secretary of the Treasury Andrew Mellon, and Senator Arthur Vandenberg. Early in his political career President Harding gave a popular lecture on Hamilton to various audiences, while Senator Vandenberg wrote a book on Hamilton, The Greatest American. Andrew Mellon, whom many consider to be the best Treasury Secretary since Alexander Hamilton, praised him in his book Taxation: The People’s Business. Yet by his persuasive and enlightened arguments, Hamilton secured the ratification of the Constitution. There is no more remarkable victory in parliamentary history. The ratification of the Constitution by a sufficient number of States soon followed. There was at last in existence a Federal Government which was founded on national integrity. He believed in protection [tariffs] in the first place as a means of national defense. He desired his country to be self-sustaining and self-sufficient…After national defense he advocated protection as the method by which the nation would increase its power to produce wealth. 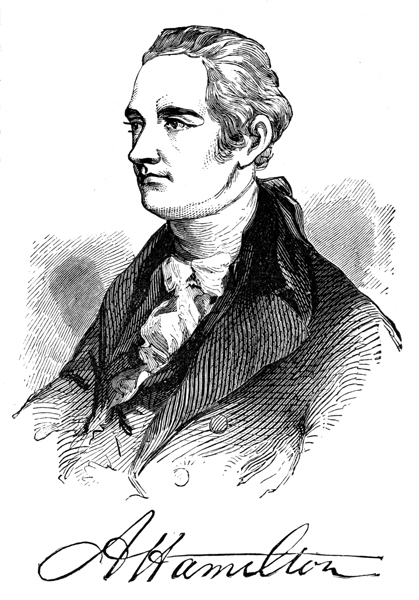 The party now in power in this country, through its present declaration of principles, through the traditions which inherited from its predecessors, the Federalists and the Whigs, through their achievements and through its own, is representative of those policies which were adopted under the lead of Alexander Hamilton. The political economy of Hamilton focused on a commitment to a limited government, sound money (the Gold Standard), low levels of taxation and regulation, and economic protectionism. These were the economic principles that were at the core of the Harding-Coolidge economic program. In fact in 1922 the nation was still recovering from a severe economic downturn and Coolidge stated that “it is the policy of the Republican Party, in so far as it can influence conditions, to reestablish fiscal stability.” Coolidge told the nation in his remarks honoring Hamilton that “there is no such thing as the general welfare of the people in a period of business depression.” For Coolidge the “application of the theory of Hamilton to present conditions” was necessary to restore the economy in the aftermath of the Great War and this was exactly the policy that Harding and Coolidge followed to precipitate the Roaring Twenties. This doctrine our party still supports and still applies to the business regulations of this republic, not that business may be hampered but that it may be free, not that it may be restricted but that it may expand. All the elaborate functions of the government will be of no avail, unless there abide in the people the simple, homely virtues of industry and thrift, honesty and charity. Without these characteristics there can be no advance in the general effectiveness of the government or the general welfare of the people…There can be no national greatness which does not rest upon the personal integrity of the people. Forrest McDonald, “How Conservatism Guided America’s Founding,” Imprimis, Vol. 12, No. 7, July 1983, Hillsdale College, Hillsdale, Michigan, 1983, p. 5. Calvin Coolidge, “Our Heritage from Hamilton,” Address on the Anniversary of the Birthday of Alexander Hamilton, Before the Hamilton Club, at Chicago,” January 11, 1922, in The Price of Freedom: Speeches and Addresses by Calvin Coolidge, Charles Scribner’s Sons, New York, 1924, p. 101.